More than 28,000 people were able to observe the Yorkshire Dales’ most famous family this summer. 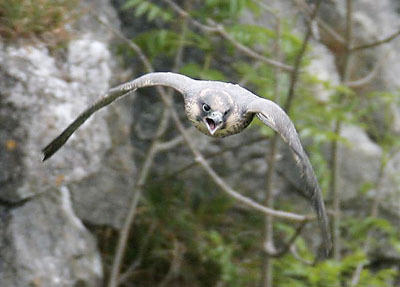 The Royal Society for the Protection of Birds (RSPB) has just reported that 3,500 schoolchildren were among the record-breaking number of people who took advantage of the project set up to view a pair of breeding peregrine falcons at Malham Cove, the sweeping 80-metre-high limestone crag that has been home to the raptors for the last few years. An earlier start to the scheme and an extension into August saw visitor numbers taking a close look at Clint and Gryke and their two chicks rise to 28,464. The venture is run jointly by the RSPB and the Yorkshire Dales National Park and involves staff and volunteers manning the Falcon Watch point so visitors can get a close-up view of the earth’s fastest animal, which intercepts its prey at speeds up to 350 km/h (217 mph). David Hirst of the RSPB said: “The Malham Falcon Watch has been another resounding success and this year the arrival of two gorgeous chicks was the icing on the cake. The huge visitor figures show just how popular peregrines are and how much people enjoy having the opportunity to watch these stunning birds of prey. “We are very grateful to the Yorkshire Dales National Park Authority for their help and enthusiasm for the peregrine watch, to the many volunteers who have helped out with the project and to the people of Malham village for their support.